Introduced for 2019 is the New Talent area, curated by internationally acclaimed speaker and forwardthinking Chief Creative Director at Trendease International, Jennifer Castoldi. ‘All of the New Talent exhibitors are up-and-coming designers in the surface and materials sector who have been in the industry for five years or less. Jennifer says of the New Talent participants: “With my team at Trendease, travelling around the globe scouting new talent, innovations, and market directions, we develop a network of design professionals that help take the industry towards a brighter future. For our collaboration with the Surface Design Show we are pleased to present a collection of startups who will inspire the attendees of the show. Many of the new talents are available for commissions and some have their own product lines, while others are providing services like micro manufacturing. 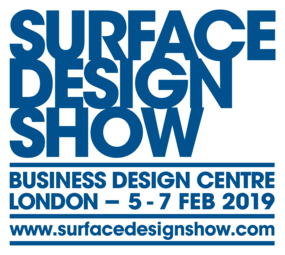 By supporting the talented new market entrants, Surface Design Show will be highlighting the freshest ideas in material design”. Inspired by the luxurious marble veneers of early 20th century interiors, Spelk by surface designer Orla Lawn (NT/2) is a fresh take on decorative plywood panelling. Through developing a colourful handcrafted finishing technique, Orla elevates a common economical building material to an elegant surface product. Spelk has a splintery look with a silky-smooth feel, inviting you to explore through touch.